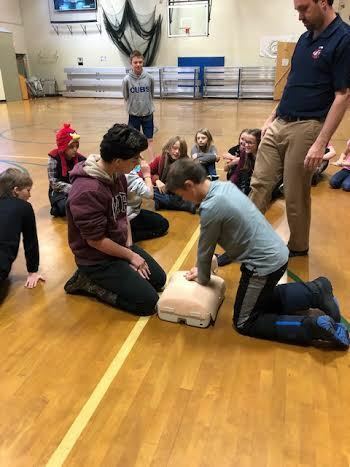 Recently, the sixth grade health class learned the lifesaving technique of CPR. This was the first of a two part series. Led by instructors and members of the Lyme FAST squad, Aaron Rich and Lisa Rayes, students learned about the appropriate hand placements for performing CPR on children and adults. The second part of the series will include learning how to use an AED, which the Lyme School has three placed throughout the building. We are always grateful for community members who volunteer their time to work with our students on life skills and help others in a times of (medical) need.